Today, the 4th leg of the Tour De France ended with an Araud Demare sprint stage win in addition to an unfortunate crash. 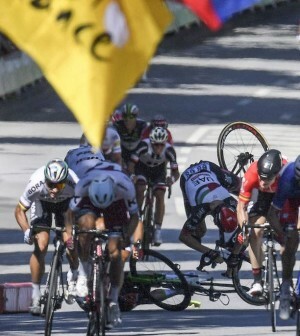 During the final sprint of the race, Peter Sagan accidentally elbowed Mark Cavendish, forcing him into the boards and causing a three bike crash in the middle of the road. Cavendish ended up finishing but had to go in for an X-ray for medical treatment. Here’s how it all happened. At about 60 km/h the sprint line began shifting into the right hand side of the road as Cavendish followed Demare. As Sagan moved over to use Demare as a lead-out-man and seemingly elbowed Cavendish in the process. While trying to balance his weight out, Sagan forced Cavendish away, leading the 30-stage Tour De France winner into the barriers. Cavendish is okay but walked away with a sling and needing finger stitches. Critics of the decision believe that it was a bit harsh to disqualify Sagan, citing the difficulty of navigating himself through that situation in an alternate way. Though others agree that his manoeuvre directly resulted in another participant’s demise and therefore got what he deserved. Either way, it looks like the race is heating up as the race continues.